FAYETTEVILLE, Ark. - Officials with the VA Medical Center in Fayetteville and the U.S. Department of Veterans Affairs announced an investigation Monday after a pathologist was found to be "impaired" and misdiagnosed patients, resulting in at least one death. Dr. Skye McDougall, the Network Director and CEO of the U.S. Department of Veterans Affairs, made the announcement on Monday. "I want to apologize to all veterans for what we're going to disclose today," said McDougall. "What we're going to talk about today is a very serious and, I believe, very tragic situation with tragic outcomes for our veterans." She then introduced Dr. Kelvin L. Parks, the interim director for the VA Medical Center in Fayetteville, to explain what happened. According to Parks, a Veterans Health Care System of the Ozarks pathologist was found to be "impaired" on March 22, 2016. The pathologist was immediately removed from clinical care. The pathologist had no previous disciplinary actions and was "deemed an excellent candidate of the impaired physician program." Parks said he could not comment on the nature of the impairment, because it was still under investigation. He also said he couldn't comment on whether the pathologist had been arrested or would face criminal charges. After what Parks called "successful completion of the program" and implementation of a monitoring program, the pathologist was reinstated on Oct. 12, 2016, Parks said. One year later, on Oct. 13, 2017, he was suspended again on reports of possible impairment. Another investigation determined the pathologist was deemed "unsafe to work" and was removed and subsequently fired, Parks said. Parks said the pathologist saw 19,794 patients. Letters are being sent out to all of them, or to their family members. The hospital is responsible for 53,000 patients each year, he said. Of the more than 19,000 patients involved, 5,250 have died since 2005, and those deaths are under review. He said they did not know if any of the deaths were related to the pathologist's review. Parks said they had seven cases of misdiagnosis by the pathologist so far based on internal reviews. One of those cases may have resulted in the recent death of a local veteran, according to Parks. "We have already notified five of those that have been affected, and the remaining two will be notified by tomorrow," Parks said. The VA is now reviewing all cases related to the pathologist, he said. The reviews are being conducted by independent reviewers, Parks said. He said letters are being sent out to all patients and/or family members whose cases were read by the pathologist to let them know about the process. The VA would then follow up by phone or by letter once the second review is complete. A procedure was already in place to address any issues that arise with patients impacted, including ways to track second reviews and tests and protocols to notify affected patients. "If errors are found that affect the patient's current treatment plan, the VA will reach out immediately to those affected," Parks said. He said the VA has already strengthened internal controls to ensure any errors are more quickly notified and addressed. "Patient safety is a top priority," Parks said, adding that he was also a patient at the hospital. "This is my hospital," he said, becoming emotional. "And I'm truly sorry, and saddened, and disgusted... and to our veterans, and to our family members, we will continue this investigation and ensure that those who are involved be held accountable." Parks said the process would take several months to complete. Parks then introduced Dr. Margie Scott, medical center director of the Central Arkansas Veterans Healthcare System and chairwoman of the review team, who explained the review process. "We will be doing a complete 100 percent review of all cases that were interpreted and diagnosed by this impaired provider," she said. "We will be going from October of 2018 back to October of 2005. This will take a significant amount of time -- several months." She said more than 900 cases had already been reviewed, with the seven misdiagnosed cases being found. Of those, one of the patients had died, and an investigation was underway to determine how much of an impact that misdiagnosis had on the patient's condition and death. She said there were up to 30 pathologists who are "willing, ready and able to assist" in the review. She said it's the goal for at least half of the case reviews to be performed by pathologists outside of the VA.
She said cases will be prioritized by level of risk, and every veteran who is affected should have a letter from the VA within the next several days. "As soon as any additional misdiagnosis is identified, the patient, the veteran or the veteran's family will be immediately notified," Scott said. Westerman said a veteran in his district died as a result of the pathologist's actions. Several federal officials were on-hand for the announcement, including U.S. Sen. John Boozman and U.S. Rep. Steve Womack, Congressman Bruce Westerman, representatives from U.S. Rep. French Hill's office and U.S. Attorney Duane Kees of the Western District of Arkansas. Steven Young, deputy undersecretary for Health for Operations and management at the U.S. Department of Veterans Affairs, Dr. John Areno, acting chief medical officer for Veterans Integrated Surface Network 16 also attended, as well as McDougall and Parks. Boozman praised the hospital and its volunteers before addressing today's announcement. "Sadly, today, we have a tragic situation, and it truly is a tragedy, in the sense that we have failed," Boozman said. "The congressional delegation is united in this, we're going to do all that we can, certainly any service that we can provide to take care of the veterans that potentially have been impaired." "I appreciate the forthrightness of the VA in coming forth," Boozman said. He said they would not only help veterans but also hold accountable "those who need to be held accountable." He said they would work to ensure problems like this don't happen again in the future. Westerman said the delegation was briefed by the Inspector General and the Veterans Administration last Thursday in Washington, D.C.
"This is a colossal failure of the system, not necessarily because the system in itself is flawed," Westerman said. "Even with proper procedures in place, systems fail and can lead to the most undesirable results." "Unfortunately, according to our briefing, we already know a family in my district lost a loved one because of an improper diagnosis, and there are many more cases yet to be evaluated," Westerman said. Womack said the larger issue is that proper information is given to the affected veterans, and he said there were thousands of veterans who could be affected dating back to 2005 when the pathologist came to work for the VHO. "We are not going to rest and we are not going to relent until we see each and every case reviewed and the proper actions taken," Womack said. Parks said the hospital is currently working to recruit a new pathologist, and they have hired a fee-basis provider to work in the interim and maintain care for the veterans. Boozman, Womack, Westerman and U.S. Sen. Tom Cotton and U.S. Rep. Rick Crawford later released a joint written statement Monday regarding the pathologist. “This alleged gross negligence by a physician charged with caring for our veterans is a disturbing revelation and a clear failure to uphold the Department of Veterans Affairs mission to the men and women who served our nation in uniform. The errors and reckless actions of this former VA pathologist put the health of our veterans at risk and will not be tolerated. “Unfortunately, at this time, we don’t know the extent of this doctor’s misconduct. 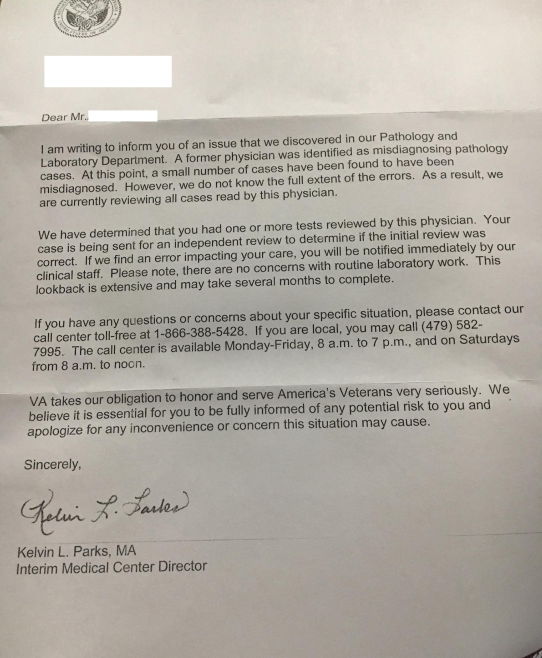 We call on the VA to notify patients whose cases were evaluated by this pathologist to thoroughly and expeditiously review their results so veterans can get the appropriate care they earned. Those impacted deserve nothing less. Parks provided two phone numbers for those with or wanting more information. Those numbers were 1 (866) 388-5428 and locally (479) 582-7995 locally. The hours for the call center are Monday-Friday, 8 a.m. to 7 p.m. and Saturday from 8 a.m.-noon.